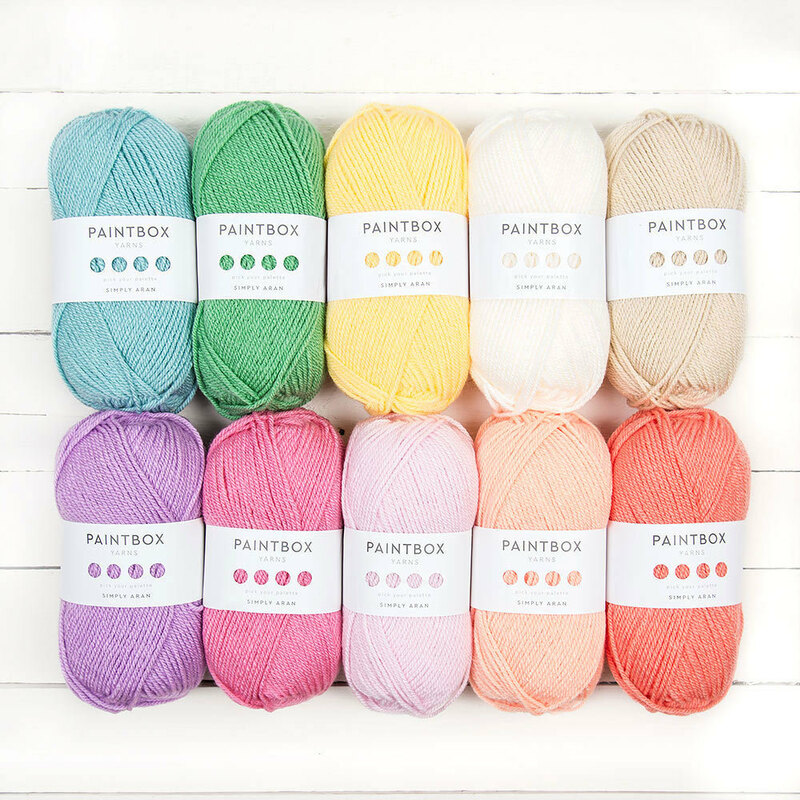 This month I have been testing and designing in Paintbox, a relatively new yarn brand which has quickly caused a frenzy on Instagram and Facebook. When the opportunity arose to actually try some out I surprised myself and asked to try the acrylic, not the cotton range. Until now, the only acrylic yarn brand I would ever use is StyleCraft Special which I love for it's softness, quality, and very reasonable price tag. I was interested to see how Paintbox would compare to my beloved Stylecraft - would I like it just as much or perhaps even better? I was eager to find out. 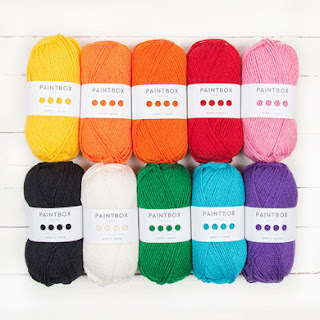 Paintbox Yarns come in either 100% cotton or 100% acrylic balls. The cotton range is available in DK (light worsted/sport) and aran (worsted). The acrylic range comes in DK, aran, and chunky weights. Both the cotton and acrylic ranges come in 60 different shades - yes 60! Their tagline "Pick Your Palette" certainly rings true. It costs £2.25 for a 100g acrylic ball and £2.50 for a 100g cotton ball making it one of the most affordable yarns on the UK market right now. 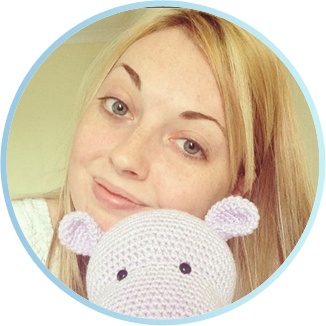 The brand is available exclusively from LoveCrochet, a UK based online yarn retailer. Yep, you can't get them anywhere else! Thankfully, the shipping prices are super cheap and truthfully, if you are in America, the price of shipping would be close to the same as an American website. Shipping to America is only $4.95 but completely free if you spend over $60 - very reasonable! If you aren't in the US, you can check the exact price of shipping to your country here. I have ordered from LoveCrochet many times, and as always my package arrived within a few days. As I tore the pretty pink parcel bag open and got my hands on the yarn I knew I had made the right choice. The acrylic aran felt so nice and so soft, the colours were to die for, and the balls were thick and plentiful. There are 184 metres of yarn in a 100g ball of the Simply Aran range, so a little goes a long way. I designed this stripey rainbow giraffe (get the free pattern here) with my selection, and still have loads left in thick plentiful balls, even after making that elaborate rainbow yarn mane! Paintbox also works up so neatly and beautifully. It's hard to have inconsistent tension with this yarn. It seems to hide all tension troubles and makes a thick, neat fabric. The fabric created is also very soft with very little fuzziness which makes for lovely, cuddly toys! I wouldn't hesitate to give the giraffe I made to a baby or toddler with the confidence that the yarn wouldn't irritate or scratch a baby's delicate, sensitive skin. Paintbox also glides smoothly and effortlessly over my hook, with little resistance or squeaking. As for things I don't like about the yarn? Well, to be perfectly honest there's nothing I don't like about the yarn itself. Truly. The only negatives I could mention is that the shade names aren't printed on the labels, so if you were ordering many similar shades it would be difficult to know which shade is which. This could cause a small problem when having to reorder more of one colour if you aren't exactly sure which shade you need. I also find some of the shade names a little confusing. The purple yarn I have used in my giraffe is named "Dusty Pink" where in my opinion something like "Lilac" would have been much more simple. These are tiny negatives that can be easily fixed and does not actually impact the use of the yarn which quite frankly is wonderful. The big question - would I use it over Stylecraft? Yes, I think I prefer it slightly to Stylecraft. Paintbox feels a bit more luxurious and doesn't have that "shiny" look and feel that Stylecraft sometimes has. This brand is fast becoming one of my favourite go-to yarns and I have a feeling it will always be present in my stash from now on. So what are you waiting for? Get shopping and try some for yourself!